Not to get too deep, but memories are what make us human. Visualizing the past and future and predicting outcomes is what separates us from our pets. Think about the last thing you ate. Can you remember what it was? Who was around? Did it taste good? If you are anything like me you have no memory of what you did five minutes ago, let alone the last time you ate. Remembering my own name and my social security number is a challenge for me. I also forget important anniversaries, phone numbers and assorted other details. Memory issues with ADHD can be funny, but they can also be totally annoying. Keeping more than one idea or piece of information in our minds is difficult. As I always say, in one ear and out the other. It’s aggravating but it is part of who we are. Learning about working memory and ADHD can help you to stress less and live more. In my article about dealing with your poor working memory, I wrote about the idea of monotasking. If there is one thing I know, it’s that trying to do all the things never works. Trying to multitask, or juggle several activities at once is a recipe for disaster. In Coaching Corner we talk about doing one thing at a time, all the time. For example, when at work focus on one major project for the day. At home, choose one household chore. Check out my article on monotasking for working memory. Understand that you can’t change your brain in a permanent way. Or at least you cannot change your brain without medications. My memory was much better, and I could hold more individual items in my mind when I took medications. Ask your doctor about medications to help. – Prioritized with one important item for each list. – Write things down, muscle memory helps. – Keep a calendar that works for you. – Break large projects into smaller, manageable chunks. One step at a time. – Develop routines that take the thought out of things. See my post on simple habits. – Practice mindfulness in order to combat distractions. – Exercise, move your body to improve your brain. It works. Finally, forgive yourself. Just do it. When you screw up, or forget your mother’s birthday own it. Apologize and move on. People might get offended, but all you can do is explain. 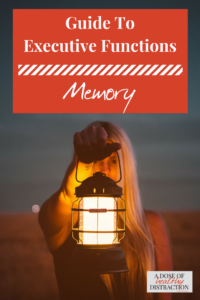 Tell the truth about your working memory issues. Explain what you do to stay on top of it. Journal often, it will help you when you need to go back and review something from months or years ago. Plus it is good for your emotional management. It can be tough, but learning about working memory and ADHD can help you to stress less and live more. Join my mailing list and get 5 days of fun, informative videos straight from me.